The president signs the $1.5 trillion measure, rather than waiting until January, after seeing TV news coverage speculating about whether he would sign before Christmas. 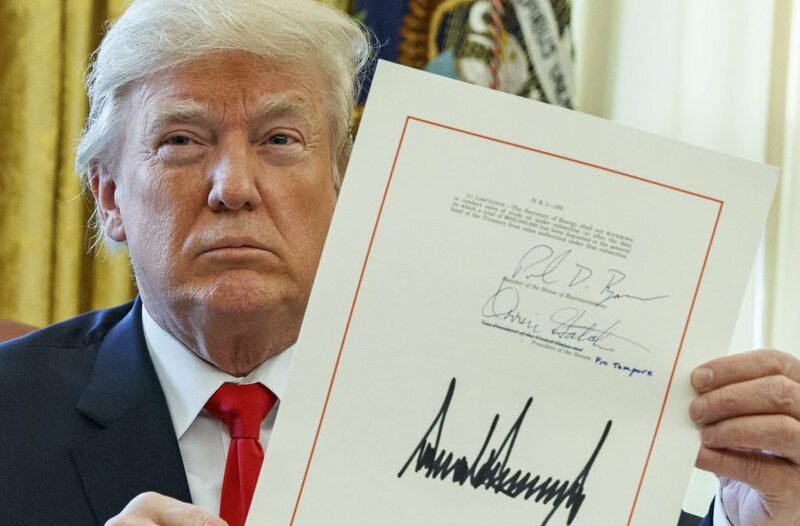 WASHINGTON — President Trump on Friday signed the most significant overhaul of the U.S. tax code in 30 years, delivering on a pledge to finish work on the longstanding Republican priority by Christmas. Trump signed the $1.5 trillion measure in the Oval Office shortly before he was scheduled to head to his Mar-a-Lago resort in Florida for the holidays. The measure is the most significant legislative accomplishment for Trump in his first tumultuous year in office. Passed with only Republican votes, it will affect nearly every household and business in the country. Corporations will see a massive tax cut, while most Americans will see temporary savings of various sizes. And in a move that may prove politically perilous in the coming 2018 midterms, Republicans delivered the biggest gains to the wealthy. Polls have showed the bill is unpopular, but Republicans argue Americans will view it more favorably once they start to see savings in their paychecks. Trump said he was going to wait until January to sign the bill in a larger, more ceremonial setting until he saw television news coverage Friday morning speculating about whether he’d sign it before Christmas. “I called downstairs and said, ‘We have to get it ready now,'” Trump said. Trump also pointed to a number of companies that have said they are using part of their savings to give bonuses to their employees. Trump praised the work of Republican lawmakers who worked on the bill, including Senate Majority Leader Mitch McConnell, R-Ky., and House Speaker Paul Ryan, R- Wis., none of whom were present. The president then took a swipe at Democrats who didn’t support the bill. Trump said his next priorities will include an infrastructure bill aimed at spurring investment in the nation’s ailing roads, bridges, airports and waterways.